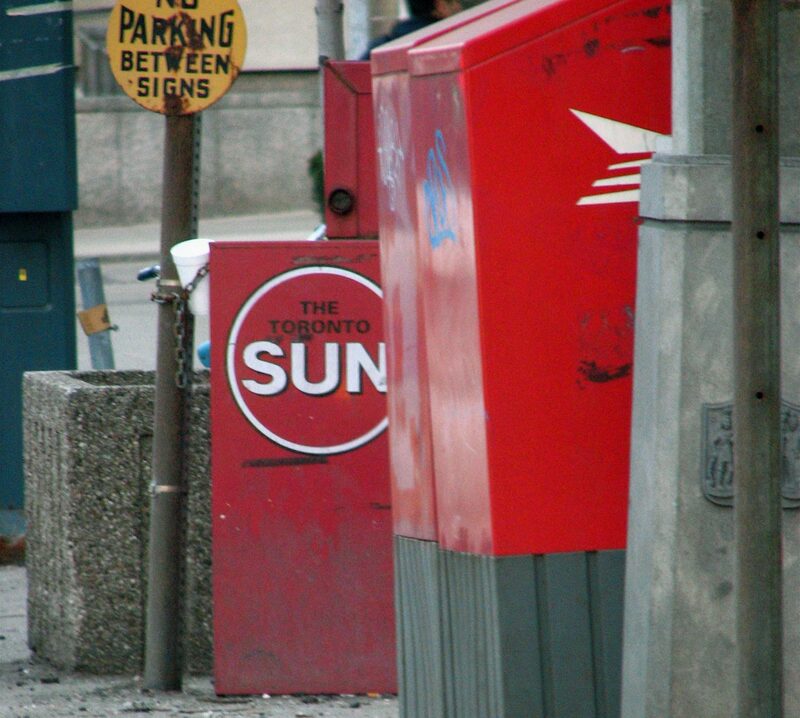 The Toronto Sun's newspaper box. Photo courtesy of Matt MacGillivray/CC BY 2.0. Is there any accountability in Canadian media for those who fan the flames of anti-Muslim and anti-immigration sentiment? That question has been on my mind in recent days after a hotel in Toronto temporarily housing hundreds of asylum seekers was almost burned down in an apparent arson attempt. The Radisson hotel in the city’s east end had attracted the attention of far-right agitators eager to paint the refugees living there as uncivilized, dirty, and dangerous. At one point, three YouTubers, including a white nationalist, went to the hotel to film and harass unsuspecting guests. Meanwhile, dozens of online reviews slammed the hotel for overcrowding and alleged bad behaviour by refugees, many of the reviews originating from accounts that only had left that single review — a clue that it may have been part of a coordinated campaign by online trolls to create accounts and flood the hotel page with angry and often racist comments. Levy’s reporting, such as it was, helped the story of supposedly uncivilized and ungrateful refugees go viral, getting picked up by a range of xenophobic and anti-Muslim websites including the far-right conspiracy outlet InfoWars. The attempted arson attack took place after her first piece was published, and although it’s impossible to establish a causal link, it should still inspire some introspection from Levy and the Toronto Sun. Sadly, that introspection does not appear to be forthcoming. 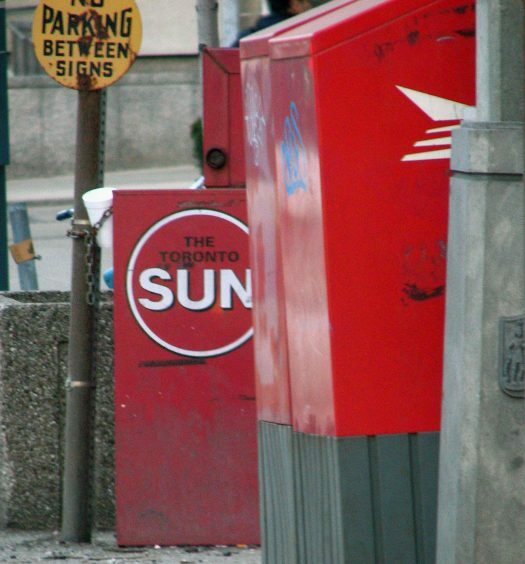 The reality is that the Toronto Sun, always a populist right-wing tabloid, has become even more extreme in recent years — particularly on issues of immigration and Islam. Many of the paper’s columnists, including Levy, Anthony Furey, and Tarek Fatah, were at the forefront of opposition to M-103, the parliamentary motion that sought to study Islamophobia in Canada. The motion passed in the aftermath of the deadly mosque shooting in Quebec, but Sun figures attacked it relentlessly as an assault on free speech, or worse. Since irregular border crossings spiked in 2017, the paper’s most prominent figures have also been raising the alarm about the threat supposedly posed by people who are often fleeing war and persecution in their home countries. The paper’s obsession with immigration is leading to some embarrassing errors, such as a recent Candice Malcolm column that claimed newcomers who were ineligible to vote had received voter registration cards. As it turned out, Malcolm had conflated voter registration with voter information cards, which are not accepted at the polls. The Sun appended a correction to a subsequent column, but not the one that included the false information. It remains uncorrected, as does Levy’s column that included the false claim about goat-slaughtering refugees. Many of the paper’s columnists have also appeared, at one time or another, on Rebel Media, lending mainstream legitimacy to the discredited online outlet that has employed several prominent white nationalists and anti-Muslim campaigners. Which brings me back to the question I started off with: is there any accountability in Canadian media? The answer appears to be no. But just because the Sun refuses to clean up its act doesn’t mean the rest of the Canadian media should ignore the paper’s toxic output. That means, at the very least, actively countering the misinformation pushed by the paper that hurts vulnerable communities in Canada. It means demanding Sun figures answer for their role in spreading xenophobic and anti-Muslim hysteria, rather than responding with a shrug of the shoulders. And it means a careful consideration by the rest of Canadian media about why these same figures, including Sun editor Adrienne Batra, continue to be invited to TV and radio panels and other spaces that carry the implicit approval of the wider industry. If the last few years have shown us anything, it’s that ignoring hateful and inflammatory rhetoric is to turn a blind eye to the real harm it can cause. Several hundreds refugees in a Toronto hotel experienced what that feels like earlier this month. Let’s not continue to ignore the problem. Ishmael N. Daro is a freelance writer whose work focuses on debunking online misinformation. He’s on Twitter at @iD4RO.